The Great Motoring Show Countdown of 2016 is finally over. 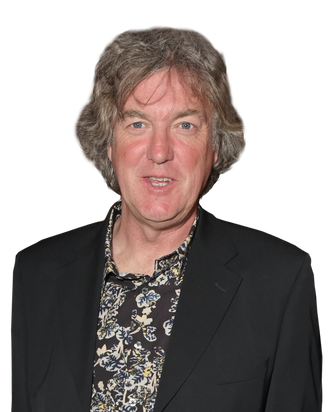 After a year of anticipation, the ex–Top Gear trio of Jeremy Clarkson, Richard Hammond, and James May premiered their new Amazon series, The Grand Tour, last Friday to stellar reviews. For fans of the old Gear, seeing them fool around and drive supercars again is surely a delight — as is the influx of Amazon’s money. (The first episode’s sprawling opening sequence in California’s Mojave Desert was estimated to cost in the low millions.) On a recent afternoon, Vulture sat down with May at the Classic Car Club Manhattan to discuss reinvention, where he’d like to film next, and why everybody should chill out about the BBC. How did you three decide that Amazon would be the best home for the new show? This isn’t my forte, but we liked the new platform and we liked the streaming thing. Amazon was prepared to do it in such a way that they would give us a healthy budget, but they would also let us produce the show as our own entity. We formed a production company [W. Chump and Sons] to do it. So we had a budget, freedom to do it ourselves, and then we had to make a car show. Can’t do much else, and it’s best that they leave it to us. Did you field other offers? I’m sure there was a massive amount of interest. We had a sort of gentleman’s agreement that whoever we decided to choose, we wouldn’t reveal what the others were. But they were massive, massive organizations! Brilliant! What are the key differences between Amazon and the BBC? Do you have more creative freedom now? Jeff Bezos has said that the show is “very, very, very expensive,” and the sharp production quality attests to that. How were the traveling-tent studio and cinematic segments fleshed out? The cinematic element is that it’s in 4K, which makes all the difference, and also makes it a lot more difficult to do. You need more kits and people and there’s a huge amount of data, which has to be shipped back and makes the edit take longer. But the quality of the films are amazing mainly because we took with us quite a lot of the sound cameramen that we used to work with in the old days on Top Gear. Over the years, we’ve been honed in with probably the best team in the world for filming cars and recording the sound of cars. It’s mainly down to them. A bit of it is 4K, but that in itself is just the tool. The tool doesn’t do the job. It’s the craftsperson who does the job, and we have the best picture and sound-craft people in the business. And the tent! The tent originally stemmed from some slightly mad idea that Jeremy had. We liked the idea that we would be a “homeless car show” rather than going to the same studio every week. And then we got this idea that we were a bit like Victorian explorers, and all of the very difficult fun they had mapping out the world back in the day. So once that idea took hold, we ran with it. But it turns out to be much more complicated than you imagine — because, of course, you need a big tent. Plus you need a hospitality tent, a support tent, a guest tent, and a technical tent for all of that 4K outside-broadcast type stuff. All the tents! By the time you finish, you’ve actually built a portable studio. It takes about a week to take apart, it’s unbelievable. It’s worth it, but it’s very complicated and I’m afraid to say an easily expensive operation. A worthy expense, I’d say. I’d think so, yes. We’re probably over budget, but we don’t look at that. We don’t spend it on clothes. You couldn’t take trademarked BBC names, such as the Stig. Did the BBC impede your production in any way that you didn’t expect? We couldn’t obviously take the name Top Gear. We couldn’t have the Stig, the Cool Wall, Star in the Reasonably Priced Car, we couldn’t use our old track. But we didn’t want to use any of those things. Even if we’d been able to, we would’ve still said, “No, we’ve done this thing before, let’s think differently.” A lot of the stories of the BBC saying I can’t use some of my catchphrases is all nonsense. They haven’t tried to bully us in any way whatsoever. It’s all gentlemanly. It’s quite simple, really. The Stig belongs to the BBC, so we can’t have it, no more than I can have the boots you’re wearing. I don’t have any quarrel with the BBC. I still work for them; I’m just making a short series for them. They’re perfectly magnanimous about it. They got to invent their show, we reinvented ours. The rivalry is very healthy. I hope we’ll get to the point where instead of having one really great, big car show, there’ll be two. You have 36 episodes planned for The Grand Tour. Are there any cities where you’re particularly keen to pitch the tent? We haven’t decided the next 24 locations yet. I’d quite like to film in Central Park. I think we have asked, but we’re not allowed to. We’d like to put it in Hyde Park in London as well, but it’s either not allowed or too complicated or too expensive. Other places I’d quite like to go to are South America. Mexico too. We’ve done a lot of deserts, like in the first episode obviously, so it would be nice if we went somewhere very snowy. Asia and the Middle East would be great. We can even possibly do one in Australia or New Zealand, but we’d have to plan that really well. You have to film in Central Park! We’ll get Bill de Blasio on the phone. You make a good point. The other thing that’s more complicated than we thought, which is pretty interesting, is that you want to have a nice view out of the window. Sometimes it’s just very naturally beautiful like the desert, but sometimes, like we did one in Rotterdam, it’s the European cityscape. You’ve also got to think about the time of year, which direction the tent is facing, what the sun is going to do as it comes straight through that big window, or else you can’t film anything. Let’s talk about that opening sequence in the Mojave Desert. I was going to say, lots of reports on the cost. The price is going up with every report, but yes, it was very expensive. What was it like filming that? Did you get it all in one take? It’s one of those fun television storytelling things that you do for real, and then you go back and film other bits like the wheels of cars or clouds of dust to piece the story together. So it’s more than one take, but in terms of how we drove through the convey of Mad Max cars, we did that in one go. And we got it right! But when you’re actually in the car, you can’t see a bloody thing. It’s terrifying. You have to make your way through the throngs of cars, and sometimes you get as close as inches away before you actually see anything. I’m conflicted because I like being in deserts. I find them sort of cleansing, but there’s another part of me that hates dust. And I particularly hate dust in cars, so it’s a huge conflict going on there. Calling the venue Burning Van was pretty amusing. [Laughs.] That was one of those things where someone in the office said, “Ho ho ho, we can call it Burning Van.” And the next thing we knew, we’d actually arranged a burning caravan to be there. That probably cost a bit of money as well. Spending our pocket money. The Grand Tour has been in development for more than a year. Is it a relief to finally have the series out there? It is. We tried to tell ourselves that we were relaxed. We knew we had a certain amount that the fan base would be able to get the show on Amazon Prime. We knew we’d be doing something fairly familiar. So there would have to be a pretty massive shift in the public perception of us and the tastes of our audience for it to be a complete failure. So I thought, logically, it must work. But it was still fantastic as the first episode starting streaming and we looked on the Twitter feed and saw all of these nice things coming through. I pressed the Twitter icon and I thought, shall I? But it was all good. Have you ever thought about your television legacy? Or your greatest moments? [Pauses.] That’s an interesting question. Maybe from Top Gear it would be taking the Bugatti Veyron to its top speed, because that’s something that isn’t impossible for much longer. But amongst stuff I’ve done, there were things like a flight in the U-2 spy plane with the U.S. Air Force [in “James May at the Edge of Space”]. I was able to look at the curvature in the Earth and look down at California and the sea at over 70,000 feet. I’d be quite happy if that was the only thing people have ever seen of me. I’m amazed it’s lasted as long as it has. I feel like I may have gotten quite old, and a little bit of me thinks that I’m too old to do this type of thing. But I’m very grateful that I’m still allowed to do it. I got into it just thinking, Oh, television, maybe I’ll have a go at that. I could’ve never imagined that it would get to this.